Spain is a country that shares the Iberian Peninsula with Portugal. It is considered an exotic destination in Europe thanks to its many attractions. The cities of Barcelona and Madrid are vibrant and charming, while the surrounding waters provide many beaches. There are a lot of things you can do in Spain, and the most famous is riding with the bulls in Pamplona. You can also visit Granada, and let’s not forget about the Canary Islands and Tenerife. Lastly, the food is delicious in Spain. Their traditional food is paella, which is made with rice, duck or seafood, fresh vegetables, and spices. The nightlife is also appealing, and the people are laid-back and welcoming. You are going to have an amazing time in Spain. But before you plan a wonderful trip to Spain, you need to check out the visa requirements. What you need to know is that Spain is in the Schengen Area, so if you do need a visa, you must apply for a Schengen visa. You do not need one if you travel from another EU state or an EEA (European Economic Area) country. EU and EEA citizens have the right of free movement within the Union. A visa-exemption is also given to people who travel from the countries that are in the visa waiver program (Annex II). However, this category of travelers can stay within the Schengen Area for up to 90 days. All the other nationalities must apply for a Schengen visa. The best way of finding out in which category you are is by using iVisa’s Visa Checker. All you have to do is access it, select your nationality from the drag-down menu on the left, and choose Spain as your destination. The result will let you know what you need. Plus, if you do require a visa, you will be given a list of the nearest embassies where you can apply. 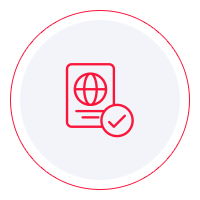 Since Schengen visas are not available online, iVisa cannot help with the application process. Nevertheless, we still want to be helpful, which is why our support service is at your disposal 24/7 and is free of charge. As far as Schengen visas are concerned, you should know that you have more than one option when it comes to the issuing embassy. What does that mean? It means that a Schengen visa that you get at the embassy of a particular country grants you entry in all Schengen states. Even so, the Schengen visa policy is pretty strict about which embassy to choose for your application process. So, if you wish to visit Spain only, then naturally, you must get your visa from the Spanish embassy. However, if you have multiple destinations in the Schengen Area, you must go and apply for your visa at the embassy of the country which is your primary destination. Lastly, if that cannot be determined, you must pay a visit to the embassy of the country that you visit first. We are sorry that we cannot help with the Schengen visa application process before you go to Spain, but we do hope that the information above is useful.